Further to my last post, here’s part of the trail of correspondence over Peter Golds’ complaint to District Auditor Jon Hayes about East End Life. He had complained it breached the Local Government Code of Conduct. I am writing regarding the London Borough of Tower Hamlets’ response to the recent guidelines approved by parliament, regulating council run newspapers. Tower Hamlets was the first to run a weekly newspaper and this organ, East End Life, has a reputation of being a notorious, publicly funded propaganda sheet. The veneer of TV listings, restaurant reviews and the description of “community newspaper” is an attempt to conceal the blatant propaganda. 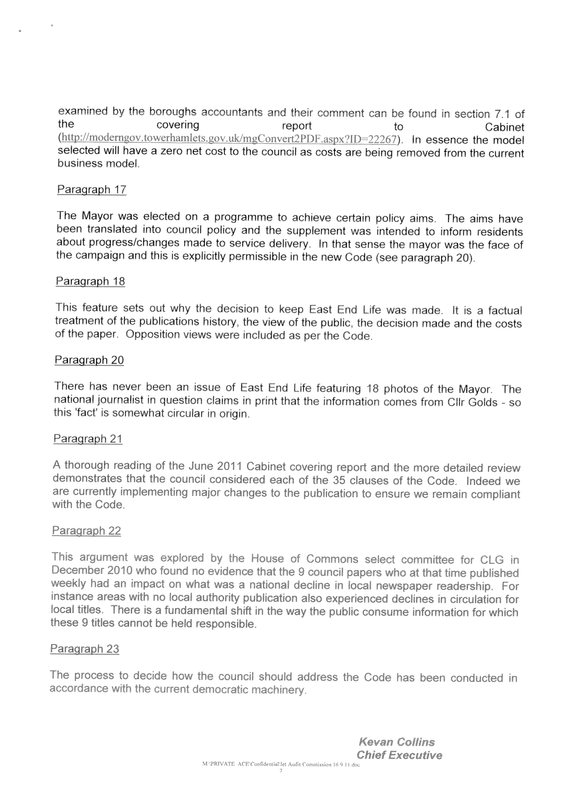 The Code of Practice was published on March 31 and includes new guidelines to limit the frequency of council newspapers to a maximum of quarterly, prevent council newspapers from emulating commercial newspapers in style or content and limit content to information about business and amenities of the council or other providers. When the government guidelines were introduced the administration of Tower Hamlets led by the Executive Mayor, Lutfur Rahman initiated a review of East End Life. 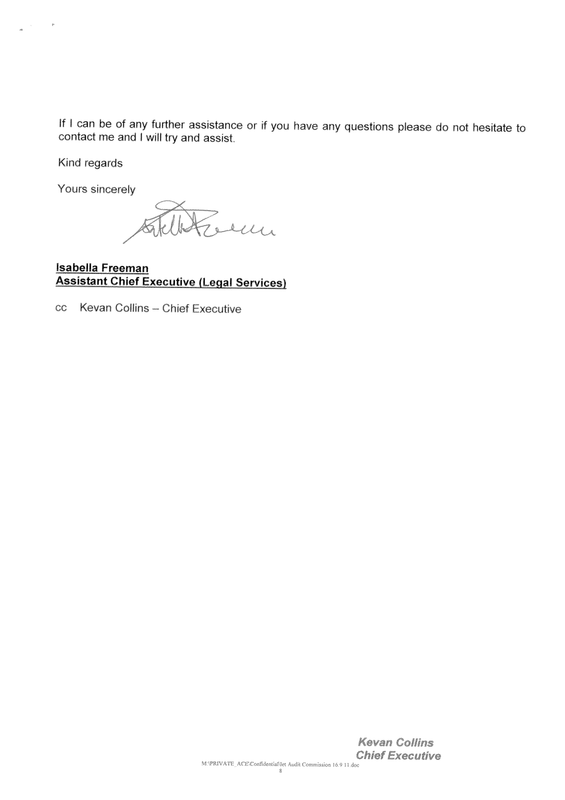 This was conducted by the council’s paid Head of Communications, Takki Sulaiman who is responsible for writing East End Life, and meets weekly with the Mayor to discuss what goes in it. At this point it would be worth noting that as the author and driving force of the review, he would be unlikely to facilitate a review that recommended scrapping most of the responsibilities associated with his own paid position. 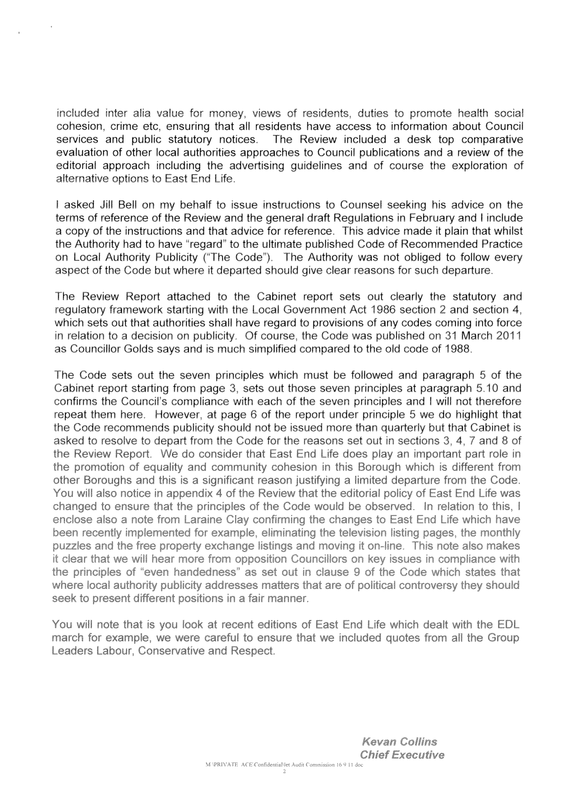 On 8th June this year, a report was bought to the meeting of the Cabinet (papers attached – Agenda item 10.2: East End Life Review – CAB 006/112) which presented the review and its recommendations. This was approved by the Executive Mayor, who has reserved all decision making to himself and was then ratified on July 6th, after Overview and Scrutiny had asked the Mayor to re-consider his decision. He made his July 6th decision in less than a minute, without publicly considering or responding to the concerns expressed by the Overview and Scrutiny Committee. You will be able to see that the entire report is misleading and ignores public and stakeholder opinions. Also notable is the fact that the few solid answers that were gained from executing the review were not taken on board. East End Life under the guidance of the officer responsible for East End Life conducted its own survey of residents, via itself. In conducting this survey 624 people responded, out of a population of 250,000 in the borough. 88% of those responding did so through either an online survey or an open response via the council. But these two methods were advertised only on the Council’s own website and social media or through East End Life. Unsurprisingly there was a 64% positive view of the paper from this survey. This is misrepresentation of a meeting where the recollection of those present is completely different to the comments published. There are other serious errors of fact contained in the report. The report claims that to abolish East End Life would cost the council £2.1million, and that reductions in frequency would also involve (lower) net costs to the council. The £2.1 million figure comes from the difference the council estimates it would cost to put its statutory advertisements in the local press and the internal transfer cost of advertising in East End Life. There are three things wrong with this approach. The report bases the cost of advertising in the local press entirely from its rate card. Conservative councillors had already confirmed, in public at council meetings and in the review meeting that the East London Advertiser would offer the council a loyalty rate of £150,000 per year and make available two pages a week for 52 weeks. The review did not take this into account – because no-one involved in it bothered to contact the Advertiser to check this out. Most astonishingly of all, the £2.1 million figure in this report doesn’t include the savings that will be made by no longer writing, printing and distributing the paper. The council already costs this at £1.5 million. Consequently the £2.1m is the gross replacement cost (i.e. counting extra costs only) not the net replacement cost which would take these savings into account. This report commissioned by the Executive Mayor, and approved by him in under a minute, despite overwhelming reservation from members, results in the continuation of a paper that is not wanted, needed or required by the residents of Tower Hamlets. I further enclose two copies of this newspaper with examples of how this paper is not all it purports to be. Whilst it does have information for residents, it also serves as the campaigning mouthpiece for the Executive Mayor, Lutfur Rahman. You will note in the edition of 23-29 May, there is a supplement on pages 20 and 21 described on the front page masthead “A look back at the Mayor’s first six months in office”. The heading of “achievements” on the pages is indicative of a highly selective and partisan description of his administration. One could add that there is no mention of the many column inches that have filled the independent media on the somewhat more colourful aspects of this period. In the edition of 11-17 July there is a feature “Why East End Life is here to stay”. This is again partisan and totally lacks any sense of objectivity. Neither of these itemised features could meet any description of being even handed, objective or appropriate. East End Life has no letters page, there are very few opportunities for non administration councillors to be featured in the wall to wall coverage of the Rahman administration. Indeed in one infamous issue a national journalist counted eighteen different pictures of Lutfur Rahman and there are well documented accounts of administration members arguing for ever more photographs of themselves. Local authorities are required by Section 4 (1) of the Local Government Act 1986 to have regard to the Code of Recommended Practice on Local Authority Publicity in coming to any decision on publicity. 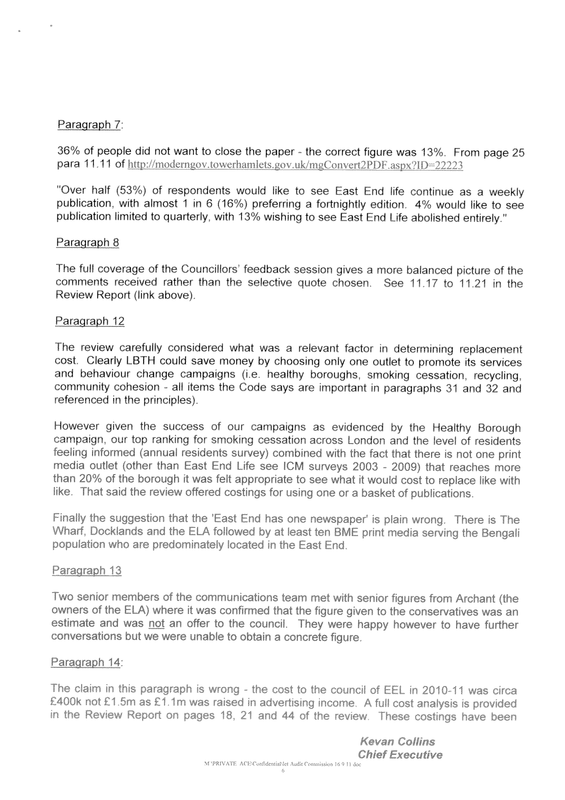 A cursory examination of East End Life shows the council are ignoring the code, by continuing to publish on a weekly basis, giving the impression that this is a “newspaper” and acting as a propaganda vehicle for the administration. 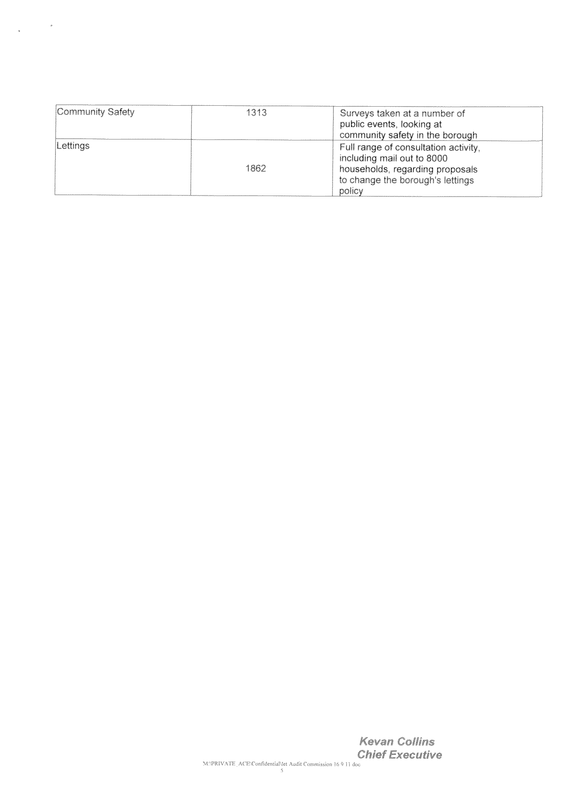 This consultation has been fundamentally flawed and results in the continuation of a crude propaganda sheet, sent out weekly which will damage the local, independent media and potentially contravene the electoral process as no political party can have regular access to campaign funds equal to those available to a local authority. Councillors are not seeking to be included in this paper. There is a majority of elected councillors from different political parties for it to cease and the funds saved be utilised for frontline services. Under the Audit Commission Act of 1998 you, as District Auditor, have the power; to issue an advisory notice; to seek judicial review, to issue a public interest report or to make a written representation which the council needs to consider and respond to publicly. I urge you to investigate this further and reach your own decisions as to whether following reading the review and our issues with it you are satisfied that the administration has sought to secure economy, efficiency and effectiveness in its use of resources. I can confirm that Ministers at the Department of Communities and Local Government are concerned about this disregard of the regulations as laid down by Parliament and I am copying this letter to Departmental Ministers. Please do not hesitate to contact me should you require any further information. Thank you in advance for your time and I look forward to hearing from you soon. 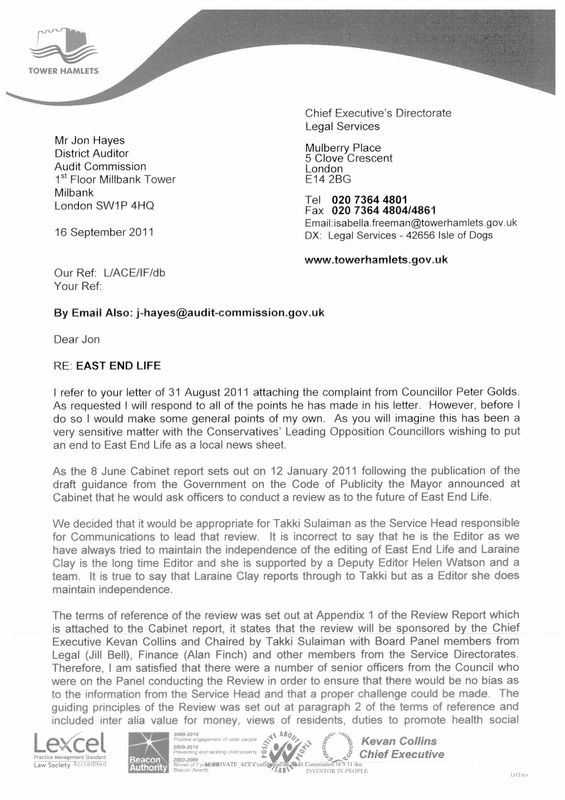 The district auditor has thrown out a complaint against Tower Hamlets’ weekly East End Life publication. 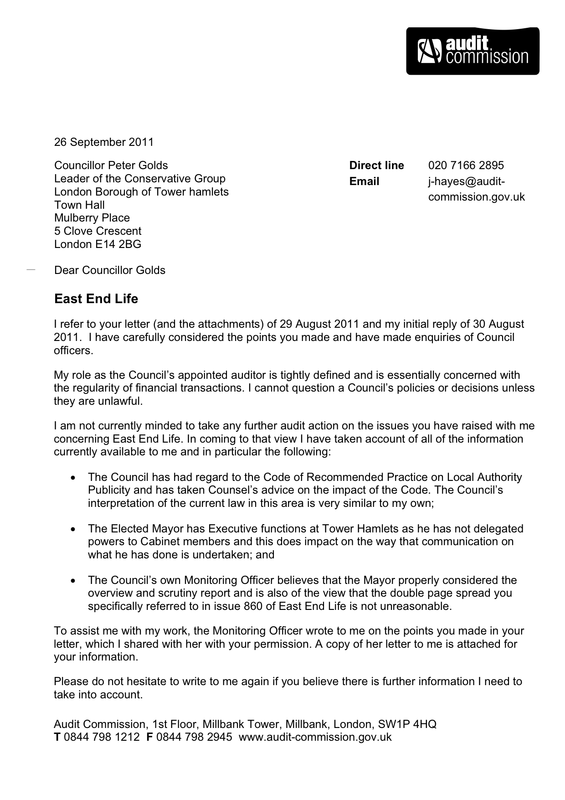 Tower Hamlets Conservative opposition leader Peter Golds first reported the council’s publication to the district auditor in July. 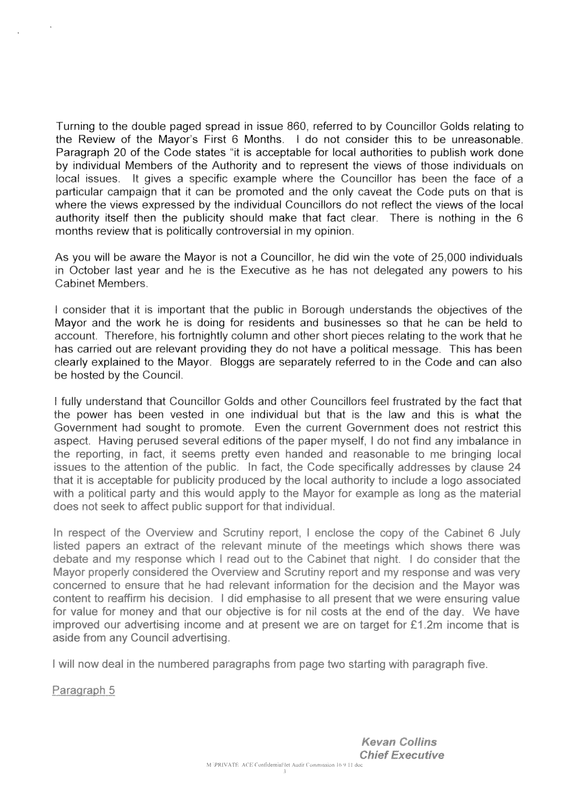 It has now emerged that the district auditor wrote to Golds on 26 September to explain that it is not minded to take any further actions against the council-run newspaper. The district auditor is understood to have written: ‘The council’s interpretation is very similar to my own,’ with regard to the Code of Recommended Practice on Local Authority Publicity. Among the code’s recommendations is one that suggests councils only print newspapers four times a year. Tower Hamlets head of comms Takki Sulaiman responded: ‘East End Life has just come through a stringent review process where it not only had to ensure compliance with the Government’s new guidelines but had to ensure it was cost-effective. In June, Tower Hamlets Council said it planned to continue publishing at the same frequency, explaining this would be the most ‘cost-effective and popular’ option. Poor Takki. Having spent most of the past month at various party conferences, I strongly suspect that smile will soon be wiped off his face. There’s also is growing irritation with the role of district auditors. It is felt they become “institutionalised”, that because they become so pally with the council officers they have to work with, they rarely dare to bite. They say they are on the side of the local elector but when did you ever see a district auditor question town hall spending in this borough after a complaint? Maybe their remit is too narrow but that probably suits them. 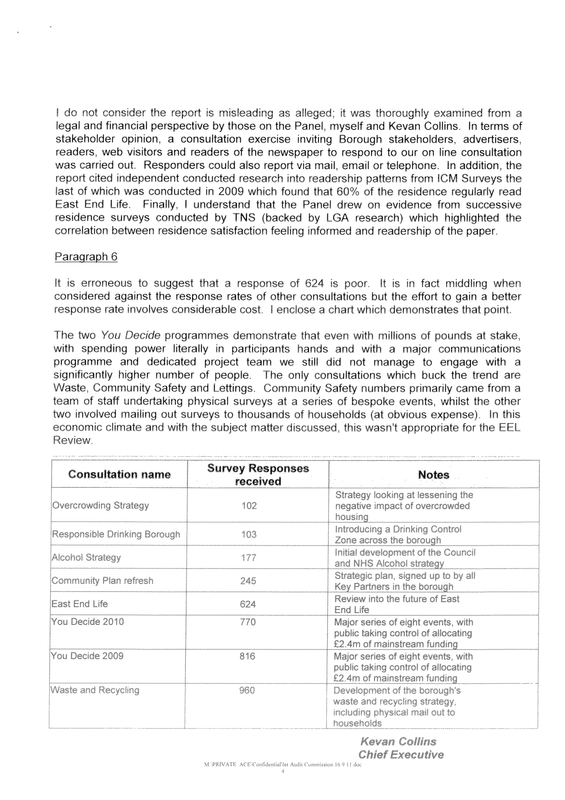 This issue of East End Life is a corruption of process in Tower Hamlets: the town hall – even in its letter to the district auditor, which was the result of a panel that included someone I know believes otherwise – misleads about its true cost and then refers to extremely dodgy self-selecting surveys to prove its “popularity”. As I’ve always said, I think it is very well-produced and it beats some of its commercial competitors in appearance and, I’m sorry to say, in content. But that’s no excuse to use public money for what it also runs: political propaganda. And when the District Auditor tries to refute that charge, he makes himself look foolish: we already know from the diaries of Mayor Lutfur Rahman and his “executive” deputy Ohid Ahmed how much time they spend sanctioning what appears each week. Even before Lutfur became mayor, Ohid as a mere cabinet member, actually used to shout at the council’s press officers if they tried to advise something was legally unacceptable to print. He was regarded as the most odious member of the administration. The media world in Tower Hamlets is in a very dark place at the moment. With a couple of honourable exceptions, most of the Bengali media slavishly lap up council press releases and toe the Lutfur line. Many councillors feel that is sadly true of my former paper as well but I think it’s more question of resources and a lack of feel for the dynamics for the area, including what politics represents. On the broadcasting front, Lutfur has Channel S sewn up, so I’m led to believe. Of course, that station has often fallen foul of Ofcom and it is run by a convicted fraudster who was allegedly duffed up and tortured by gangsters earlier this year. That man’s other company, Prestige Auto, which is based as the same site as Channel S in Walthamstow, was last week linked to another insurance scam, as reported in the Daily Mail here. Meanwhile, Lutfur’s other major backer, Shah Yousuf, is also, I understand, about to find himself having to defend a libel action over wife-beating smears about former Labour leader Helal Abbas. Anyone with a bit of principle and a bit more cash would find there’s a decent gap in the journalism market in Tower Hamlets at the moment (business angels, you know where I am…). To prevent this post becoming too long, I’m going to publish all the correspondence between Peter Golds, District Auditor Jon Hayes, and council legal chief Isabella Freeman , in a separate entry. For those who like the detail, they’re well worth a read, particularly “independent” Ms Freeman’s contribution: as an exercise in the art of local government obfuscation, it’s unbeatable.